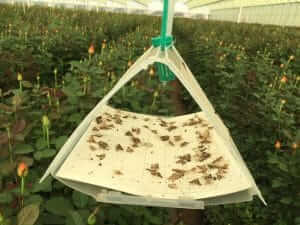 Femtrack - Kenya Biologics Ltd.
FEMTRACK is a complete system for trapping male and female moths. The system consists of: the FEMTRACK lure; a delta trap; and sticky paper. FEMTRACK will attract different species of moths; Duponchelia, Helicoverpa, Spodoptera, and others. Once outside its original sealed packaging, the FEMTRACK lure will start releasing its scents over a time period of 20 weeks. This will attract moths, which will be caught on the sticky surface of the FEMTRACK paper. FEMTRACK provides an effective means to trap and kill moths. FEMTRACK provides information on pest dynamics, and it can help control the pest without MRL or PHI issues. In contrast to light traps, FEMTRACK will not attract any additional moths to your crops than the ones already present at that time. You can use FEMTRACK inside greenhouses as well as in the open field. Five traps per hectare will enable you to obtain information that can indicate critical changes in population dynamics of moths present in your farm. Twenty traps per hectare will enable you to significantly reduce damage to your crops. Replace the FEMTRACK lure every twenty weeks. The sticky paper needs to be replaced when saturated with moths. The delta-trap will last several seasons under normal conditions. Store the FEMTRACK lure in its tightly closed original packaging. Accuracy of the FEMTRACK lure is guaranteed for two years when kept at a constant temperature below 4°C. When stored at room temperature shelf life is six months.